Awards for Slow, but Generous Runners. 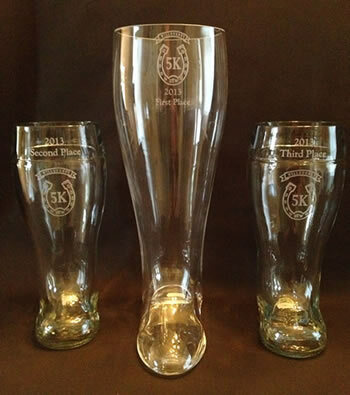 1st Place: A custom engraved Downtown Willoughby 5k two-liter beer boot. Be the envy of the post-race party as you strut your stuff carrying Das Boot. 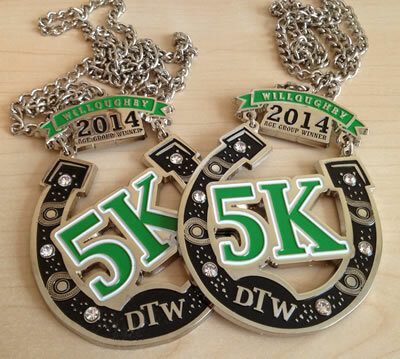 2nd and 3rd place: A custom engraved Downtown Willoughby 5k one-liter beer boot. Not as awe-inspiring as the two-liter boot the first place finisher takes home, but will still make everyone else jealous. The top 3 ladies and fellas in each age group will take home a custom age group winner medal (2014 shown here). Wear it around the house. Wear it when you go out. This is your way of letting people know you're better than them. Wish Runners are a generous group, so we figured they should have an additional opportunity to win something. The fastest male and female Wish Runners will each win a special prize (still working on it, but it'll be special!). Results will be posted every 5-10 minutes as runners cross the finish line. This is meant to be a day of good fun, but we know that competitive spirit hasn't yet died in you. We'll be timing you with the best technology around, so you can prove to all your friends and family that you're a better runner than they are. Western Reserve Racing will be on hand to provide accurate results using MyLaps chip timing. This timing system is used at the largest marathons and Ironman events, so you can rest assured knowing you will be reliably timed. Watch for your time on the big finish line clock and view the official standings posted at the race, plus this website within 24 hours.